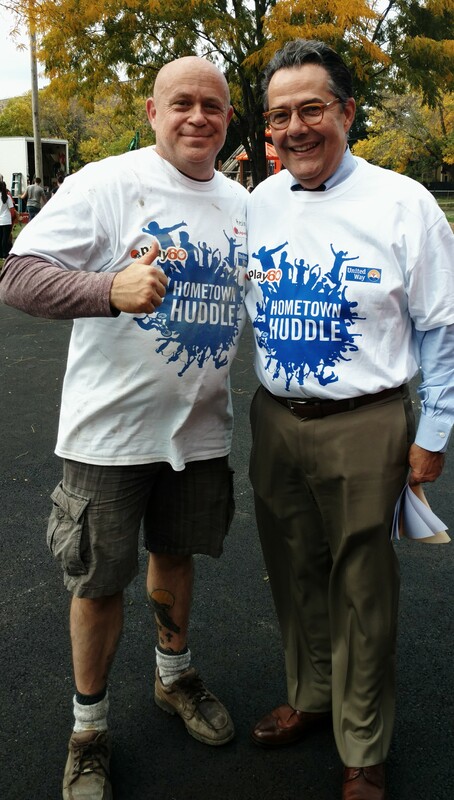 Every year I look forward to participating in the United Way of Greater Cleveland’s Hometown Huddle. It is a day of hard work and Community Collaboration. This program is 18 years running. BlueBridge is happy to participate and represent the Cleveland Technology Community each year. 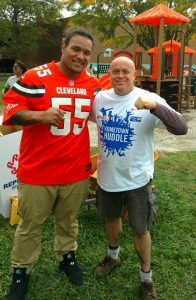 This year Browns players supported by Volunteers from the United Way and University Hospitals worked on the basketball court and playground at Luis Munoz Marin School. 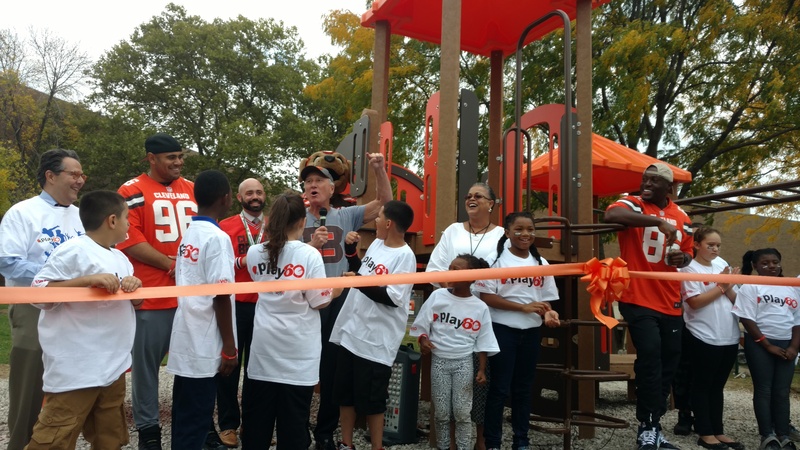 The children at these schools each year have an opportunity to see a vision of hope take place and come alive in the refurbishing and creation of play areas right in front of their eyes on their playgrounds. People of all walks of life and Cleveland Browns players come together to leave a great space behind. The effort is a symbol of Community Spirit and demonstrates the value of what can be accomplished by committing our time talent and treasure. There are many corporate sponsors who make these visions reality. This year, University Hospital participated as part of its 150th anniversary and its amazing commitment to give 150,000 hours of time back to our Region. 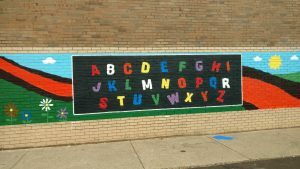 Sherwin Williams donated the paint for the murals and basketball court. The professionals at Myer Design http://meyerdesign.com/ bring the play area to life and effectively guide the multitude of volunteers in their roles. 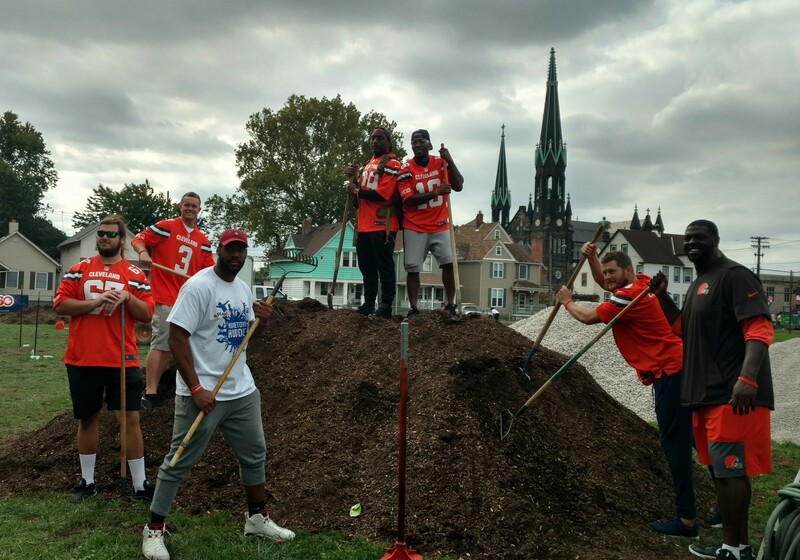 The Cleveland Browns demonstrate care about our community and fans. They know fans are giving back, and making a difference and also know there are people who need help. 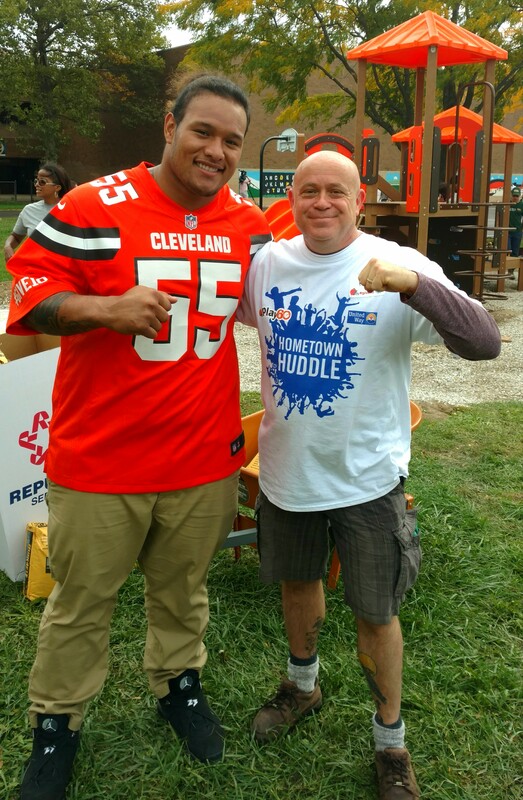 The Browns join their fans as together we move forward in the Community by giving back. The Browns leadership off the field looks for us to be part of First and Ten to help show our team and city pride. Together we can inspire local, national and global goodwill. The Hometown Huddle is part of the NFL’s Play60 Project. An awe inspiring day indeed as each volunteer walked away after the ribbon cutting having brought hope and care to school children by leaving a great, safe and colorful space for memories to be made. 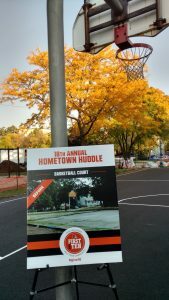 All participants worked hard and had fun, gaining a sense of immediate gratification for a job well down. These days of caring and sharing always bring a deeper and more rich meaning to my life. 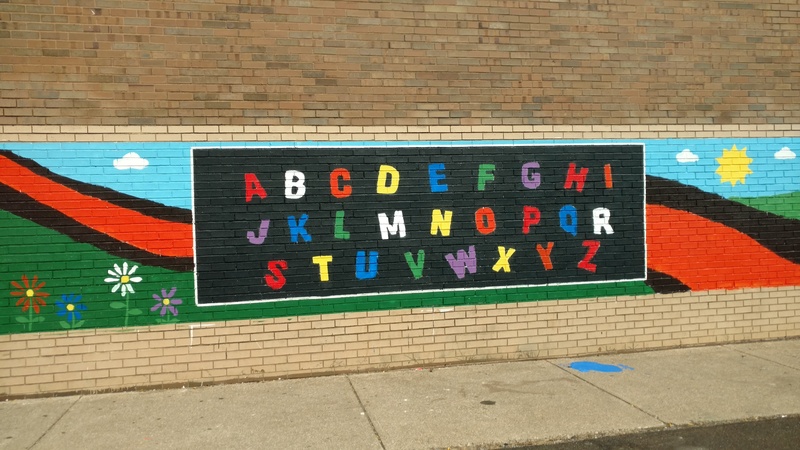 This entry was posted in Building Community, Philanthropy. Bookmark the permalink.